Standard Fire & Special Perils Policy .... as the name suggests is a standard product – covers Fire and allied perils (includes lightning, aircraft damage, riot strike, flood, inundation ....) ...... this month we have heard of more fire accidents – some in heritage buildings and some in new too. The first act when you hear fire (apart from running away) is fighting fire with equipments available and calling the Fire Brigade – Fire engines do reach the spot and fire fighters do a great job in controlling and extinguishing the fire.... for a Chennaite – the fire at LIC, Spencers, GPO, Moore Market are some which readily come to mind and alongside – Snorkell (Simon Snorkell) – which we read when LIC was devastated by fire. Understand that these specially crafted ones came into being after the 2nd WW, - turntable ladders (cherry pickers !) – a platform or bucket attached to mechanically bending arm installed on a fire truck – capable of reaching heights – which were earlier unreachable .... simon snorkels had platforms with which firefighters can rescue victims trapped on upper floors. See any Tamil movie prior to 1980s, if Hero or Heroine were to land up in the metropolis breaking away from their village – they would land up in Train (Egmore railway station) – for sure, you get to see – Beach, Central Station, red coloured Pallavan Transport (PTC) buses running in Mount Road and then there was that skyscraper (!) ,...... the tall 14 storeyed LIC Building............. the landmark building of those years, housing the southern regional headquarters of the Life Insurance Corporation of India. Wiki describes the first skyscraper of Chennai as 177 ft tall; the tallest building in India when it was inaugurated in 1959. LIC marked the transition from lime-and-brick construction to concrete columns in the region. It certainly no longer is the tallest building .... you have so many in Chennai now. In July 1975, a major fire incident occurred in the building. The fire reportedly was observed on the first floor at around 8 pm – and spread rapidly to floors above. The whole city grappled to fight – there was problem of onlookers, fragments of glasses, winds from the sea and more. There was paucity of water too though Coovum of those days was a different one with flowing water – not what you see now. The fire raged for more than a day. ..... Simon Snorkell used became such a household name and was seen in couple of RD Parades since. 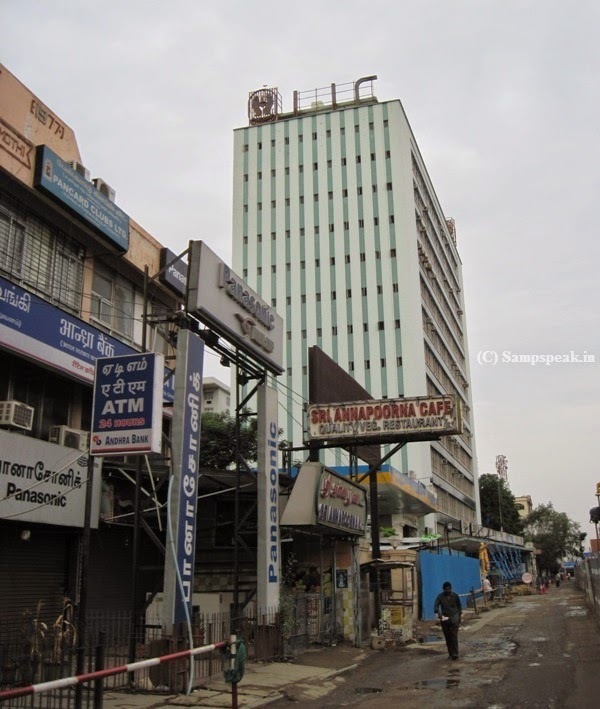 Then in 1981, was the fire loss at another landmark of Madras - Spencer Building, - not a high rise building this time – but a popular one at that. During that time, another equipment Bronto Skylift was used. 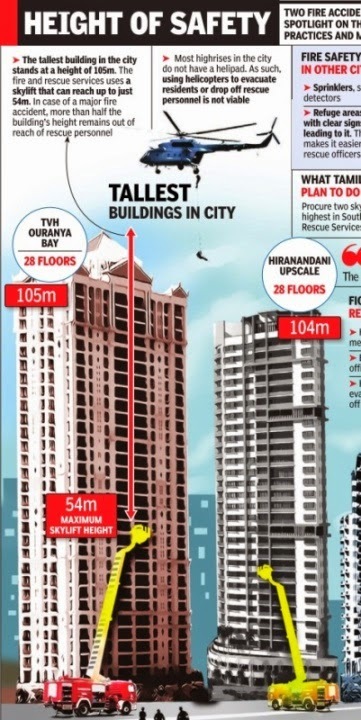 Unlike other metropolitan cities, Chennai has been experiencing a horizontal growth (expanding continuously in its area) rather than a vertical growth (more skyscrapers) –may be something to do with the fear of heights of Chennai residents too !! .... the IT Corridor aka OMR (Rajiv Gandhi Salai) is different .... it has most of the airconditoned buses – thanks to IT / ITES en route … and buoyed the good patronage, there are more and more taller buildings too.... one often sees advertisements from reputed builders about big projects and Hiranandani has a skyscraper project too. Sea-change from the time when Chennai clamoured for ground floor and first floor apartments ........... in the initial stages, there were 550 SFT – double bedroom apartments – while a recent advt of Akshaya for their project Abov boasted of 38 floor tower of 132 meters height – having only 31 apartments, one on each floor, of about 6,700 square feet, priced around Rs. 7 crore.